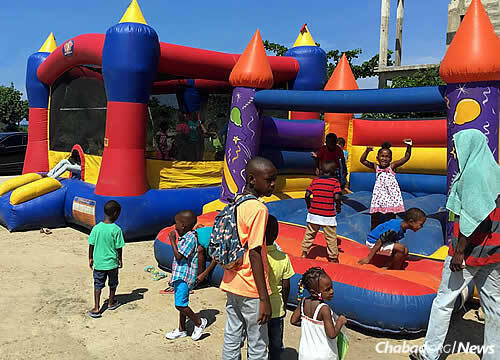 A Family Fun Day in Jamaica, sponsored by Chabad of Jamaica and the Yakub Abu-Ketzis Private Foundation, was just one part of larger efforts geared towards assisting the local population. Some 200 children received free school supplies at the Sunday event. Here, the crowd gets to hear the sounding of the shofar in the midst of the Jewish High Holiday season. 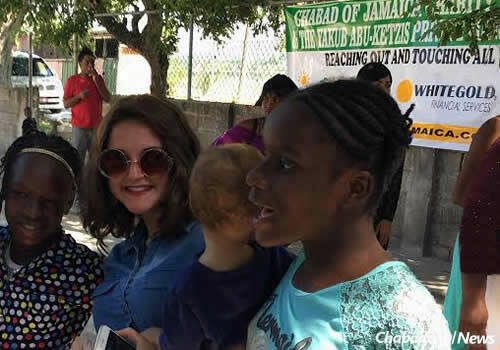 Hurricane Matthew hit some parts of the Caribbean hard, and Jewish efforts have launched to help alleviate the situation in ways big and small. While Jamaica was spared the brunt of the storm, the timing coincided with other basic general needs of the local population. 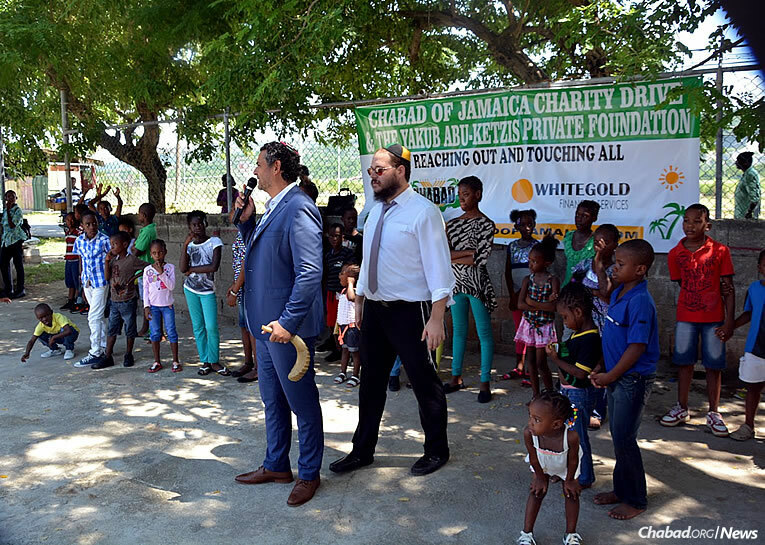 To that end, a Family Fun Day on Sunday offered food, rides, games, a moon bounce and more at the White House community in Montego Bay, a fishing-industry-based settlement with about 4,000 residents. 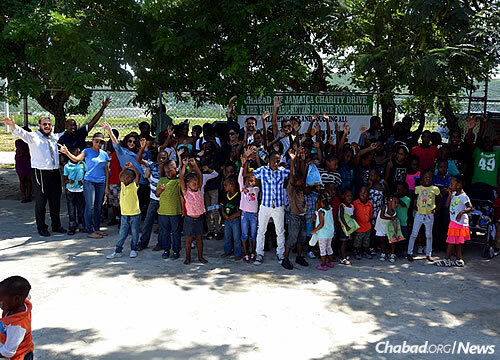 The event was sponsored by Chabad of Jamaica, along with the Yakub Abu-Ketzis Private Foundation. The Oct. 9 activities also included the distribution of school supplies for 200 Jamaican children. 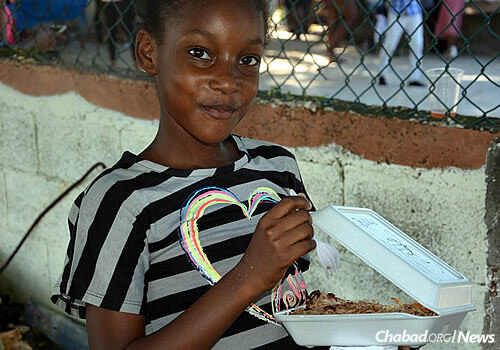 Rabbi Yaakov and Chaya Mushka (Mushkee) Raskin, co-directors of the Chabad of Jamaica in Montego Bay, have hosted many holiday, educational, social and recreational events in the two years since they arrived for area residents and visitors. 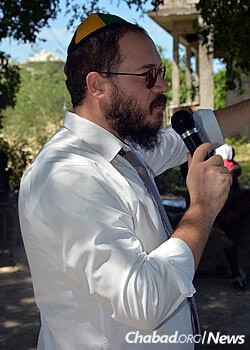 More than 100,000 Jewish tourists visit by sea and plane each year, asking about Jewish services and programs on the island. The answers come in the form of prayer services, kosher food, Shabbat and holiday meals, and even a Torah class or two during their stay. The Raskins also work with the local non-Jewish population and together with the Yakub Abu-Ketzis Foundation have begun a campaign to assist the less fortunate, especially families with children on the island. In this High Holiday season and beyond, their goal is to aid neighbors in ways they can. Children enjoyed games, food and more at the event. Moon bounces provided entertainment for the younger set. “We are so appreciative; the community was head-over-heels about this event,” said a local leader in the Montego Bay area.